Welcome to the site of the shared Kazakhstani Siamese Cats Breeding Cattery “Amulet”! 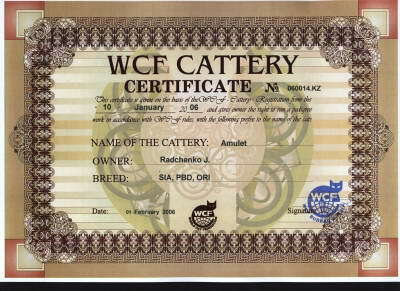 The breeding cattery has been registered with WCF and IFA and is specialized in Siamese cats breeding. Our cats live in families. We are not supporters of the cage management. According to the Thai legend a Siamese cat is a fruit of love of a tiger and a monkey. 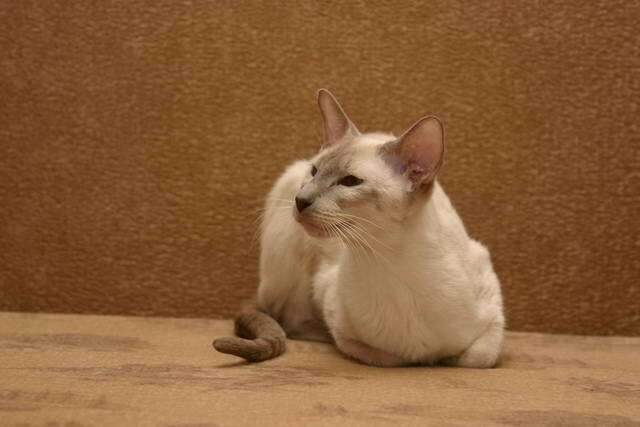 Oriental cats are the dogs in the cat’s clothing. They are very affectionate, charming, loving their owners, and are the incredibly amiable creatures. They need to be given attention on the part of their owners. All people, having closely touched base with the oriental cats, remain charmed with them once and for all. In 2002 I became keenness on oriental cats, starting form my very first cat Audrey Talisman Basilevs (sia b21). It is worth to say that the situation with the oriental cats in Kazakhstan was rather deplorable then-a-days. The catamounts of this beautiful breed could have been counted throughout the country on the fingers of one hand at that time. Moreover, they were far away from ideal. There have already been enthusiasts in Russia. The enthusiasts were in possession of perfect imported and independently bred oriental cats. However, the Russian breeding catteries were in the same stage of development when it was a crying need in own stock growing. Therefore, it was almost unreal to buy there a kitten of the perfect breed to bring to another country. We were forced to start from zero. Any breeding starts from growth of the number of queens and improvement of their breed from generation to generation. As a consequence, the tom-cats, resulted from my breeding, were not of my interest as the pedigree material. All tom-cats were given away only to well-known people under the condition of castration, to be treated with love and care. Resulting from the inbreeding copulation of Audrey with her father, oriental tom-cat Basilevs Mon Amur, ori ns24 (brought from the breeding cattery Silvan & Mon Amur www.silvan.nm.ru), owner O. Sklyarova – a superlative among the best oriental tom-cat in Kazakhstan of that period, I have got my queen Niacrice Talisman Basilevs (sia ns21) and my adored castrate Nelson Talisman Basilevs, who live and are in good health in my place up till now. In spring 2004 I was lucky enough to buy a beautiful lilac Siamese cat, Private Collection Buena Speransa (sia c), presented by the Holland pair in the Moscow Breeding Cattery “Private Collection” (www.siamcats.ru). All my further ‘feline’ activities will be inseparably linked with this breeding cattery owning to understanding, help and support of its owners, wonderful people and my friends, Anna and Oleg Titkins, I have learned much from who. Resulting from the field copulation of Speransa x Sweet Cats` Made in Holland sia n, owner O.Titkin (import from Holland), there was born Private Collection Lanvin (sia n), owner L.Rashkova. Unfortunately, it was the only one brood at Speransita. By 2005 the situation in the Kazakhstani felinology has started improving rapidly. Kazakhstan enters IFA. In 2006 I registered the Breeding Cattery “Amulet” with WCF and IFA. Before entering of Kazakhstan into WCF in the middle of 2009, I have operated under the aegis of IFA. In 2006, from Niacrice x Lanvin there was born CH Oessy Amulet (simply called Sarah) – a princesses of my breeding cattery. And from that time the situation of my single-hand floating upon the waves of Siamese breeding has being strongly changed. Michael Namyatov, sharing my ideas and thought partner, more known to the public as DJ Moyshe, appeared in front of me. Since then we have being worked together sharing one breeding cattery. In 2007 we imported the first tom-cat, ICH Private Collection Never Sad (in private life – Yenot) sia n.
From his and Niacrice copulation there was born Unique Amulet (Sonya) sia n 21, owner I.Chupina. We expect to use this cat in future. 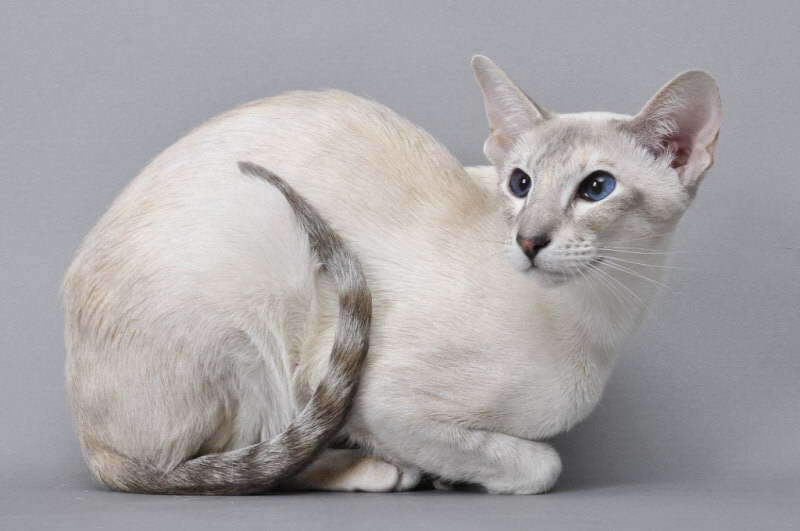 In 2009 there were born three beautiful tom-cats of blue and lilac point colors, resulted from field copulation of CH Oessy Amulet x ICH Private Collection Indiana Jones. In August 2009 we imported a new young king of the breeding cattery - Private Collection James Bond (Buratin) sia e21. A cream-color tom-cat with the elastic sociable temperament. 2010 was marked by a New Year’s gift in the form of the first brood of Sarah and Buratin. We retained in the breeding cattery their daughter Red Sonja Amulet (Tsilya) sia g 21. And from the repeated and last copulation of this couple there was born Isabel Amulet (Izzi) sia j 21. From Unique and Buratin we have got a long-nose and graceful girl Paradise Fury (Alisa) sia f 21. 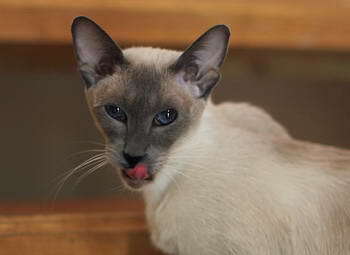 Mafdet Red Rory, of the purely Siamese breeding from Mafdet, the English breeding cattery, for our brides. We are hopeful of getting of wonderful kittens. And one more thing.. In 2010, I was blessed to meet Dina Bazhakova, my best friend and "sister-in-arms' .Since we met, we've shared our joys and sorrows with each other. No words can fully describe all the feelings I have! Let this last forever! Site designed by Olga Mangileva. We use pictures of Angelina Nagaeva, Marina Zyubina, collage and pictures of Olga Izieva, Lena Poberezhnyuk, Carol & Ron Bowles-Gowdy, cattery Private Colection.